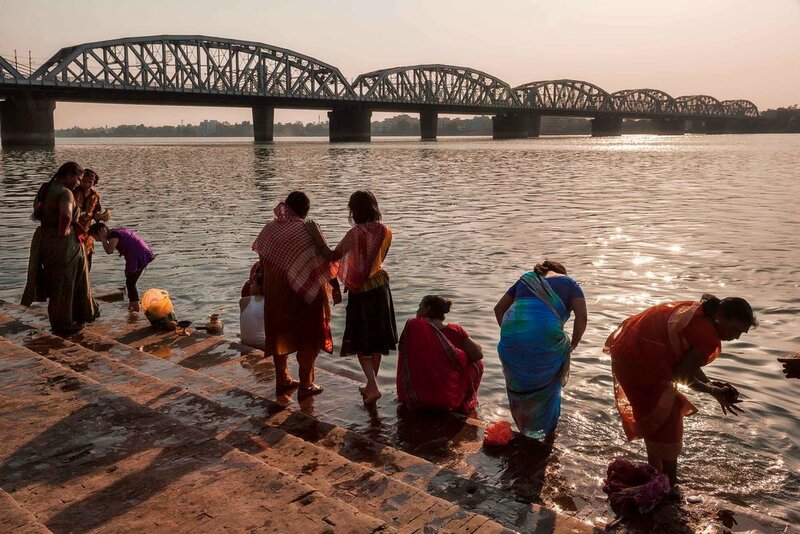 A group of visitors undertake ritual bathing by the banks of the Hooghly River in Kolkata, India. India is, to my mind, a land of contradictions. Extraordinary landscapes; incredible temples and monuments; and beautiful people can be found throughout this vast and culturally rich nation. However, ingrained corruption; extremes of wealth and poverty; and the vestiges of the caste system continue to hold this country back. I've journey to India four times since 1988. My eldest sister, Maree, travelled their in the seventies and my parents, Mary and Fred, visited India many times since the late sixties. It's interesting, as an outsider, to watch this great cultural melting pot lurch forward into the modern world. India is well on it's way to becoming one of the next economic tigers, yet many remain poorly educated and economically disadvantaged. A Hindu country, with more muslims than its neighbor Pakistan, India is the largest democracy in the world where powerless people, many of them women, could be considered as the country’s most significant demographic. On my last visit I was perplexed to discover that a number of the nation’s most significant tourist sites ban photography, due to the perception that photos can be used to help terrorists plan their acts of terror. Surely they’ve heard of Google Earth. (On a related matter Google Maps has taken an innovative approach to helping folks find their way around India’s often chaotic road system). India is a country where visitors, like you and me, may have just as much exposure to touts, thieves, illness and incredibly frustrating bureaucracy as they will to grand monuments, breathtaking landscapes and meetings with the odd yogin. But for all the hassles India remains a remarkable country. The mix of chaos, crowds, dust, heat, culture and color assaults the senses and broadens the mind. India is exotic and it’s also hard work, unless you’re travelling 5 star. But if you survive it you’ll have memories to last a life time. The above photo was made in a Kolkata backstreet late one warm, smoggy afternoon. 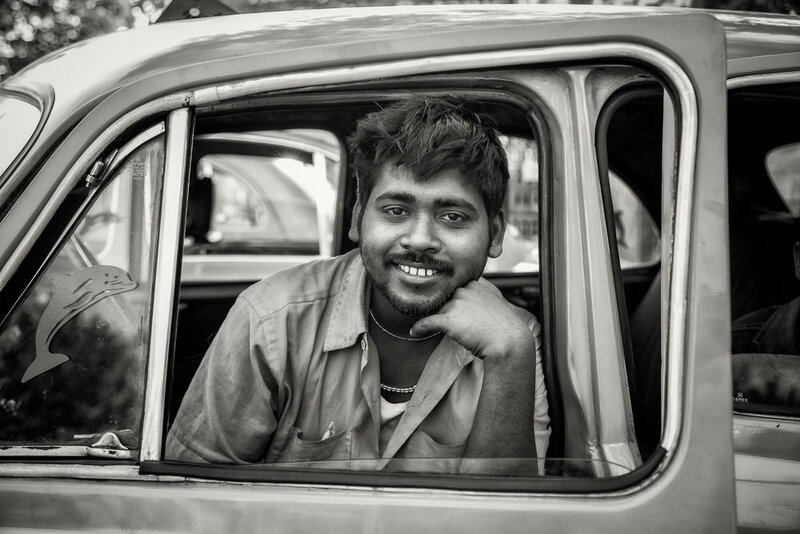 The taxi driver was a natural: friendly, with a welcoming smile. Rather than ask him to stand in front of his taxi cab, where it was likely his fellow drivers would tease him, I used the car door as a compositional device (i.e., frame within a frame) to help lead the viewer's eye into the picture and towards the driver. The taxi was quite a bright yellow/orange color, which provided a fairly striking contrast with his aqua/blue shirt. But it was his face that was of prime importance to me which is why I opted for the black and white rendering. Now the car, his clothing and the rest of the environment play second fiddle to his face. And that's how it should be. Why do I Return To India? So why do I return to India, again and again. Ultimately, it's the people. The resolute and patient way by which they go about their lives, their genuine openness and the spirituality through which many of them approach life is truly inspiring. I’m always happy when I get home. But a trip to India emerges one into the Human Condition in a very confrontational way. I feel like I’ve lived a life, even after just a few weeks in the country. India is definitely an education, one I feel that teaches me patience, understanding, empathy and compassion. And I sure appreciate the modest life I have so much more after my return home. India is good for me and the opportunity to make really beautiful, life affirming images seem to pop up around every corner. You just have to get out, walk around and meet people. Which is one of the real joys of travel. Is it not? Outside of the very best hotels and the most extravagant tours India is a very hard country in which to travel. It is getting better and, in years to come, there’ll be nothing to complain about. A casual conversation in the multi-purpose hall in the village of Maria Purem, a village named after my mother, near Chennai, India. Who Said Travel Was Supposed To Be Fun? But, for now, we need to learn from the locals. Remain calm and patient and don’t let these hassles get the better of you. It’s all part of the travel experience. When things are going badly for me I often turn to the person next to me, fellow traveller or local, and start up a conversation. It helps take my mind off my own problems and concentrates my attention on someone else’s story. Truly, it's in those chance meetings, often the moments between events, with genuine and honest folk that provide the highlights to my travels. I don't think it's right to ask if it's worthwhile going to India. It's probably more appropriate to ask yourself whether you're up to it. The fact is, outside of resort tourism, many people aren't. We can't expect that life will be the same for us once we move outside of our own, everyday environment. After all, that's why we travel. From my own experience the notion of learning to bend like a reed in the wind was never more applicable than when travelling to India. It’s all about pushing yourself out of your comfort zone. I think it’s fair to say that the more you bend, the more you’ll benefit.